Apply an Input Tone through either the internal microphone or mic/headphone jack. 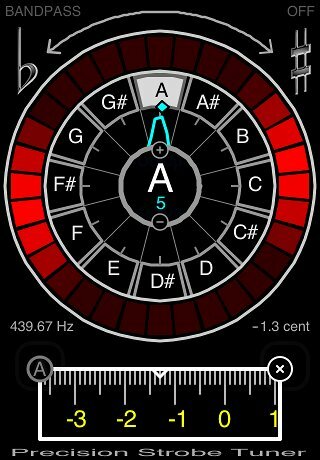 Tune the Fundamental Peak resulting in the Spectrum Display to center the Target Note highlighted on the Note Dial. The Fundamental Indicator Tic Mark along the Note Dial shows the Fundamental of the Input Tone. As the Input approaches the Target Note, a Two Group pattern will appear in the Strobe Display, rotating counter-clockwise if the Input is Flat, and clockwise if it is Sharp. When the rotation is stopped, the Input is synchronized with the Reference Pitch of the Target Note, and is perfectly in tune. The Target Note can be selected manually by tapping the Note Dial. The Octave is adjusted by tapping the + and - circles on the Note/Octave Setting ring. The Pitch of the A guitar string is 110 Hertz, Note Setting A3. The Spectrum Display shows the entire Input spectrum wrapped around the Dial, once per Octave, with each Octave shown in a separate color. All of partials of the Input show as peaks in the Spectrum Display pointing towards the corresponding Notes on the Note Dial, like the hands of a clock. 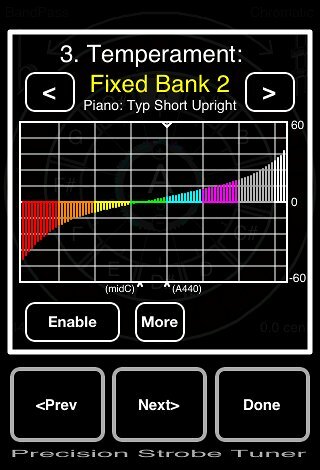 Use the Spectrum Display for coarse adjustment by tuning the Fundamental towards the center of the Target Note. When the Input approaches within several Hertz of the Target Note, rotation will become visible in the Strobe Display. Use the Strobe Display for final tuning. Figure 1 shows the Spectrum Display for a Guitar B string, B4. Note that the Octave 4 Indicator of the Note/Octave Setting in the center shows as Green, the same color as Octave 4 in the Spectrum Display. 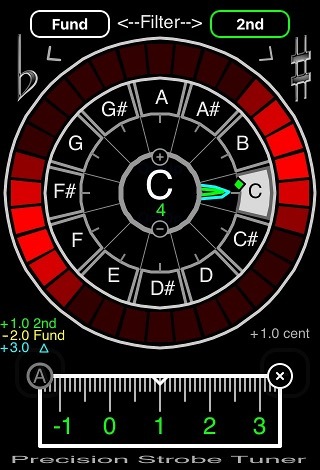 In the Spectrum Display the Fundamental shows as the large Green peak (Octave 4) pointing toward B in the Note Dial. The Second Partial at twice the frequency shows as a smaller Blue peak (Octave 5), while the Third Partial shows as a Blue peak toward F#. Note that when a string is first plucked, the attack generates a rich Spectrum Display, which settles quickly to the Fundamental and perhaps several Overtones, or Partials. The pattern of Overtones varies with the instrument, and is what our ears discern as tone, or timbre. The Spectrum Display of Fig 2 results from the relatively pure tone of a Tuning Fork. Be Advised: Overdriving the input induces signal clipping, which generally causes the Spectrum Display to go Super Nova. Adjust input levels accordingly. Excessive Background noise can also be visible in the Spectrum Display. Once the Spectrum Display stabilizes and before the Input decays, the Fundamental Indicator Tic Mark appears along the outside edge of the Spectrum Display. 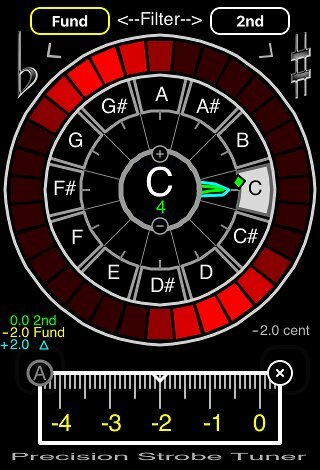 The location of the Tic Mark along the Note Dial indicates the Input Fundamental Note, and the color indicates the Octave. With the Two group pattern visible, rotation direction indicates Flat/Sharp and the rotation speed the tuning error. Final tuning is carried out by adjusting to stop the pattern rotation. Note that it doesn't matter the position of the pattern around the display, but only that the rotation is stopped, or at least as close as you can get it. The Strobe Display works like this: The Input signal modulates the instantaneous brightness of successive sections of the Strobe Display as they are rotated around at twice the Reference Frequency of the Target Note. When the frequencies are synchronized a two group standing pattern appears. Slight mis-synchronization causes a shift in phase, and the Two Group pattern appears to rotate one way or the other. The greater the error, the faster they spin. The strobe technique is highly sensitive, and response time to any changes of the Input is instantaneous. The PST is a true strobe Tuner. The Strobe Display is generated live, directly from the input signal waveform. Two Filter Modes are available through the Settings Pages. [Bandpass] Filter Mode removes noise and harmonics to generate a clear Strobe Display. Recommended for most applications. Provides clean display during the note attack. It can also be used to measure separate Harmonics of a tone, so that the Inharmonicity of a piano string can be determined. The Fundamental as a two group pattern, the Natural Fifth as a three group pattern and the Octave as a four group pattern, etc. To calibrate to, or measure the error of an external Reference Pitch, apply Input and move the Calibration Slider to gently bring the Strobe Display rotation to a stop. Tapping either end of the Calibration Slider will change the setting by one Tic. The Calibration Value is shown in the lower right of the Strobe Display Ring, and the current Target Note Reference Frequency is shown in the lower left. Figure 2 shows the display calibrated to an A 440 tuning fork. At room temperature this fork measured 1.3 Cent Flat. Briefly warming it in my hands changed it to 2.0 Cent Flat. Letting it soak in the refrigerator changed it to 5.5 Cents Sharp. 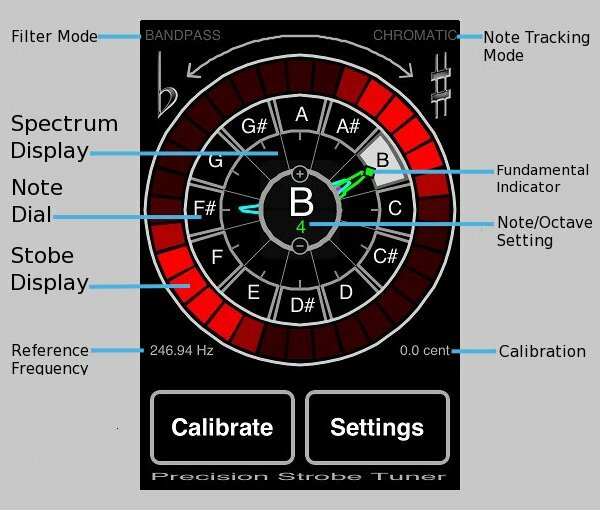 The Auto Calibration Mode can be used to automatically adjust the instrument calibration to and input pitch. To use, first tap the Calibration Button. Then tap the (A) circle at left of the Dial to enable. When a note is detected and the Fundamental Indicator shows on the Note Dial, the Calibration will begin to adjust in the direction to stop pattern rotation. Several Note Tracking Modes are available through the Settings Pages. [CHROMATC] - Target Note Follows dominant Input Fundamental Note. [GUITAR] - Provides more robust tracking for Standard Guitar. [BASS] - Provides more robust tracking for Bass Guitar. [OFF] - Manually Select Target Note. Temperament Mode is an advanced feature of the PST which provides multiple Temperament Banks with separate Calibration Settings for each of the 88 piano notes. 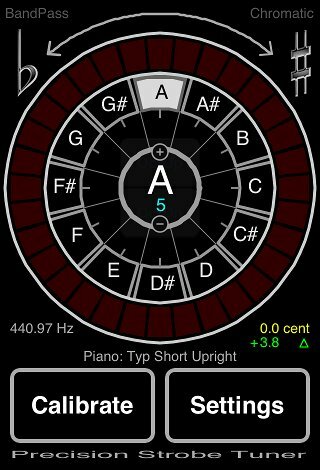 This can be useful for tuning in alternate Temperaments, tuning Piano Stretch and special Guitar Intonation systems. Five User Configurable Banks are provided, as well as several examples in Fixed Banks. Notice that now, as well as the Master Calibration value, now shown in Yellow, there is an additional Calibration value shown in Green. This is the Calibration adjustment for the currently selected Note. Change the Note Setting and this will be updated to the corresponding value from the Table. The total Calibration adjustment is the sum of the two. - Tap [Settings] and use [Next>] to navigate to the Temperament Page. - Tap the [<] / [>] Buttons to navigate to User Bank 1. - Tap the [Enable Button], highlighting it in Green. - Tap the [UnLock] Button, highlighting it in Red, to enable editing of the Bank. - Tap [More] and [Clear] to clear the Bank if it is not. - Tap [Done] to return to the main Display. Repeat for each Note to setup the Bank as desired. When done, return to the Table Page and Tap [Lock] to disable editing of the Bank. 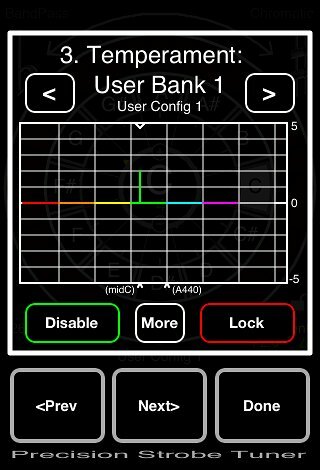 Note that when a Bank is Unlocked for editing, the Calibration Slider adjusts the Bank Note Value (Green), and when Locked, adjusts the Master Calibration Value (Yellow). Banks can also be Copied from one to another. A fixed bank can be copied to a User Bank and Modified. Banks can also be cleared. Tap [More] to access these functions. Temperament User Bank Data can be exported to the clipboard, then pasted into any plain text editor and saved as a text file. Likewise, the file can be manually edited, then the data copied to the clipboard, and then imported into an unused User Bank. Access these two functions from the [More] Button in the Temperament, User Bank Data display screen. 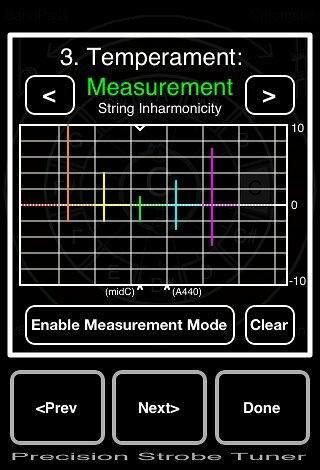 String Inharmonicity can be measured directly by first measuring the Fundamental, then measuring the 2nd Partial of the same string by setting the Note Setting one Octave higher with the BandPass Filter enabled. The Inharmonicity of the particular String is the difference between the two. With this information, a piano stretch curve can be generated. Fig 8 shows the calculated Stretch Curve Table resulting from accumulating the fit data across the keyboard. To copy to one of the User Banks, Tap [More] and [Copy]. Notice two additional buttons at the Top: [Fund] and [2nd]. These select the BandPass filter and input mode. When a string is sounded and [Fund] selected, the Fundamental will show in the Strobe Display as the usual two group pattern. Adjust the Calibration to stop rotation. Note that the Fund value, shown in Yellow lower left, is adjusted. For purposes of this Example, adjust the Calibration value to -2.0 as shown in Fig 9. 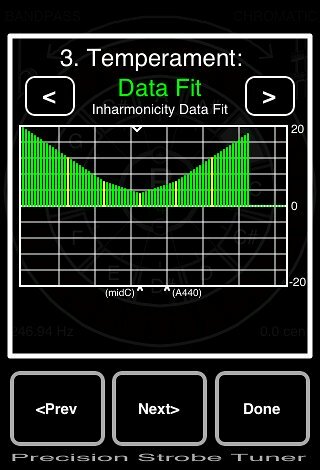 The Reference Frequency is now doubled and the BandPass filter and is now also set to view only the 2nd Partial. Which, when a string is sounded, appears in the Strobe Display as a two Group pattern, as in Fig 10. The Overtones of a piano string tend to ring a wee bit sharp compared to the Fundamental. This is due to the Overtones ringing on a subsection of the overall string, this subsection being effectively slightly stiffer. This phenomena is more pronounced on shorter or thicker strings, and increases towards the ends of a piano. For purposes of the Example, next adjust the 2nd (Green) Calibration setting to 1.0 . The difference between the two, the Inharmonicity, is shown in Blue in the lower left. The display should appear as in Fig 10. Return to the Temperament Measurement Table Page to verify that this data point has been entered. The Temperament Measurement Data Page should now look like Fig 6, while the final Piano Stretch Curve should look like Fig 8. You can now modify the levels of Inharmonicity at different points and experiment with how the resulting Stretch Curve is affected. Tip: To quickly reset and null a measurement point, Double Tap the [Fund] button. Now, after setting the Fundamental, upon selecting the [2nd] button, the Fundamental value will be transferred to the 2nd measurement value to begin that measurement. By careful selection of a few representative measurement points, a reasonable smooth fit Piano Stretch Curve can be generated. Any number of measurements can be used, From A1 up to C7. If only a few measurement points are entered, the data is interpolated between them, and extrapolated out to the ends. The Piano Stretch Curve is generated by adjusting each octave such that the fundamental of the upper matches the 2nd harmonic of the lower. This method is described in "Piano Servicing Tuning & Rebuilding" by Arthur Reblitz. Generally, start at A440 or middle C and set one or more representative measurements up and down at octave intervals or so. 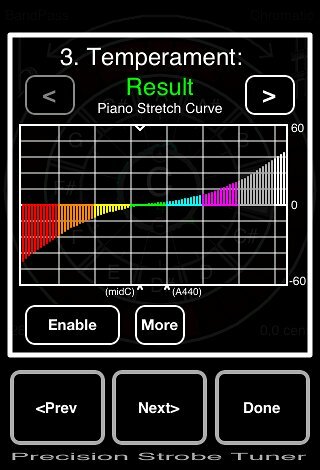 At least five measurement points are needed to generate a characteristic Piano Stretch Curve. Tip: A zero point in the Inharmonicity Fit Table can be forced by setting the Fund and 2nd settings to the same non-zero value. Tuning the Lower Octave of a piano can be problematic, as the internal microphone low frequency roll-off of many devices starts at about 150 Hz. An external mic with good low frequency response is recommended. Further, the harmonic levels of strings in this range are generally much greater than the fundamental, so can be difficult to filter. These strings are probably better handled by directly tuning their 2nd Harmonic to the Fundamental of the string one octave higher.